The AmCham Digitalization Forum was initiated in 2016 in response to wide interest from AmCham member company leaders in better understanding the challenges and opportunities of today’s digital business environment. 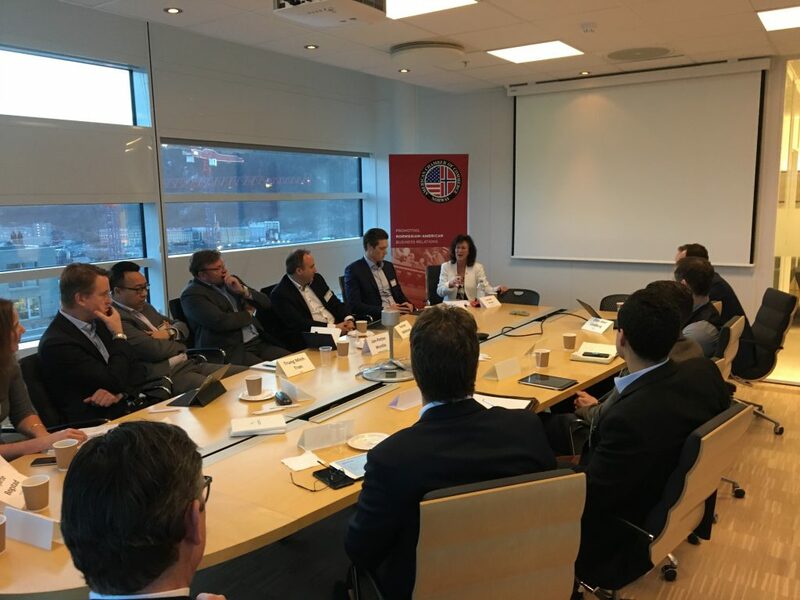 From sharing best practices to exploring how different member companies have implemented digital transformations, the series aims to foster confidence, inspire collaboration, and promote cross-industry dialogue across the Norwegian-American business community. While often discussed in terms of technological adaptation and innovation, the accelerating rate of digital change and disruption also has a pronounced effect on human resources, from employee retention to recruitment. The AmCham Digitalization Forum has taken this issue to heart, addressing issues such as leadership development in a digital age, the institution of digital KPIs, and holistic approaches to helping employees adapt in periods of intense, digital market disruption. Through our Digitalization Forum series, member companies large and small have explored to importance of cross-industry collaboration, a discussion built upon the real-world experiences of forum participants. Whether discussing peer-to-peer collaborative programs between companies of a similar size to “vertical” collaboration between different sized firms, whether through startup accelerators such as Techstars, acquisitions, or other collaborative agreements, the importance of leveraging cross-industry expertise to accelerate adaptation, foster creativity, and stimulate value creation has been a core component of the series. Throughout the Digitalization Forum, the importance of having a proactive digital strategy is often a key discussion point. Critical to the formulation of such strategies, however, is increasing one’s awareness of new trends – even in other industries. Forum participants find the opportunity to learn about digital transformation implementation and strategy formulation in response to shifting market dynamics highly valuable. AmCham’s Digitalization Forums are hosted on a quarterly, rotating basis by AmCham’s member companies, featuring twenty participants and a program that runs approximately two hours. The host of each forum typically gives a presentation on an agreed forum related topic during the first 15 minutes of the forum. From that point, participants engage in a moderated roundtable discussion for the remainder of the session. 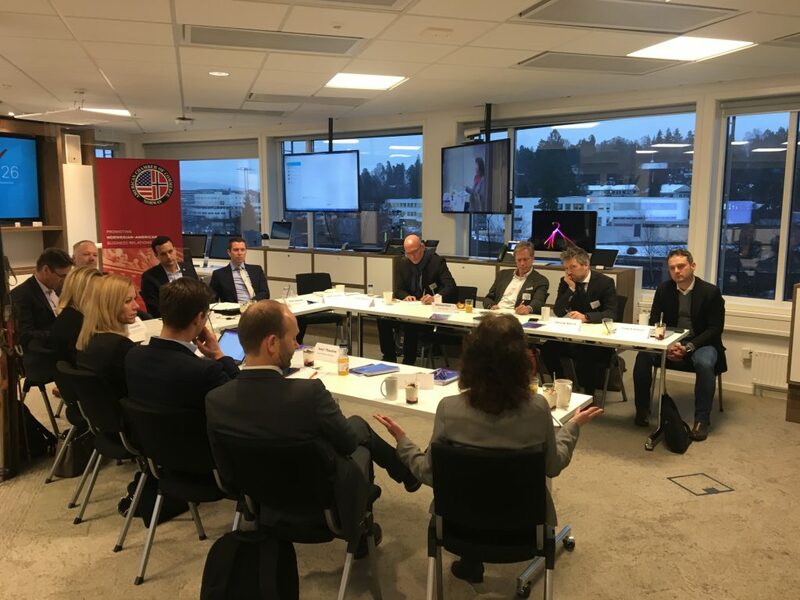 AmCham Managing Director Jason Turflinger warmly welcomed representatives from invited AmCham member companies at Discovery Network Norway’s Nydalen headquarters for the Q1 edition of AmCham’s long running quarterly Digitalization Forum. 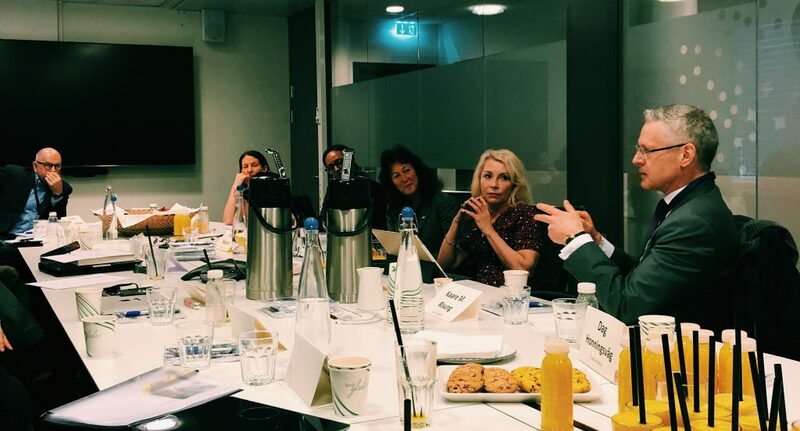 Participants first heard from Discovery Networks Norway CEO Tine Jensen and Senior HR Manager Winta Negassi, with the two discussing the strategic and human resource aspects of guiding a media company through a period of disruption and increased competition. Attendees then participated in a highly engaging roundtable debate, moderated by Next Step’s Jennifer Vessels, with topics including future preparedness, the role of management in facilitating companywide adaptation, and the importance of local content in a globalized world. Read more HERE. Addressing how Equinor is responding to digital challenges via innovative ecosystems, Equinor’s Digital Program Leader focused on why young founders, companies and new ideas are important to Equinor, how Equinor can benefit from collaboration, as well as what they have gained from the various collaborative processes. “One of the results of our digital journey is the establishment of our Digital Center of Excellence, where we work on projects that enable, improve or transform business by leveraging digital technologies to turn data into actionable knowledge,” Erspamer continued. Digital KPI’s, data trove accessibility, risk appetite within safety vs. digital initiatives, and Equinor’s new data center collaboration with Microsoft were also openly addressed by participants. Read more HERE. “We sell products that are personalized. When someone in Myanmar watches YouTube on their phone and runs out of data, we need to know that and be able to offer them an immediate and easy way of upgrading their plan,” Telenor’s VP and Head of Future Customer Service Programs, Geir Olav Guttuhaugen, said as they hosted AmCham’s Digitalization forum. Highlighted were his company’s lessons learned within Digital Ambition & the Role of Simplification. Taking 25 invited executives through some of Telenor’s most complex digital change processes, Guttuhaugen explained that fundamental to each undertaking is some level of customer experience evaluation. “At a certain point in the digitalization process, you get to a stage were significant investment is needed to drive forward momentum and to make the next leap. At that point, it is important to avoid a cost-only focus and trust your customers,” Guttuhaugen further explained. Read more HERE.